It’s no secret – patient satisfaction and a focus on value-based care is a top priority for hospitals and healthcare organizations nationwide. HCAHPS scores have a real impact on your bottom line, impacting consumer healthcare choices, government funding rates, and insurance payment structures. 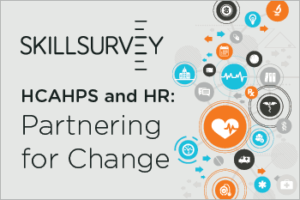 Check out our eBook, HCAHPS and HR: Partnering for Change, where we break down the critical role HR professionals can play to positively influence patient satisfaction for their organizations.